Cornwall County Events and Business links to all areas of Cornwall. This page links to Cornwall Music Events and many fine websites offering services throughout the county of Cornwall. Dog grooming at your door. Serving East Cornwall and Plymouth. 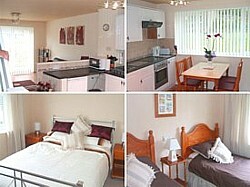 If you require a Falmouth b and b then these properties may suit your needs. Very tastefully refurbished holiday villa set in the pretty grounds of a 16th century Cornish manor estate. The villa has one spacious double bedroom, one twin bedroom and a shower/bathroom on the first floor. There is a through lounge with flat screen/dvd free view television, radio/cassette player and a dining kitchen, with all facilities..
Four Palms Bed & Breakfast is just a few minutes walk from the famous surf and sand of Perranporth beach. The shops and other amenities are even closer to this friendly quiet and sheltered family run B&B. Looking for a new job in the Cornwall area? An excellent equestrian resource for the county with loads of useful info. Website retailing various excellent therapeutic items. Diamond Disco provide entertainment with a mobile disco service, which is available to hire for events and parties to all customers across The South West. Fowey tourist information including summaries and descriptions of visitor attractions, events and accommodation in Fowey, South Cornwall. Copyright © 1998-2014 Kestrel Promotions All Rights Reserved. Cornwall is the most southerly county of south west England and with such a rich and diverse landscape there is much to see and explore. Cornwall county is the southern most county in England. Cornwall boasts over 300 miles of unspoilt coastline and a mild climate that makes the south west the number one destination for holiday makers in the UK. Cornwall is a land of myth and legend with so much just waiting to be discovered. Cornwall is divided into several areas that all have unique characteristics. From the rugged north coast of Cornwall to the gentler southern coast and the craggy moorland peaks or the lush green valleys that adorn the county.